We started potty training my son this summer at 23 months old. He was showing interest and vocalizing his need to us the bathroom (sometimes) and always after if not. For the most part, we've used the naked potty training method. When we needed to leave the house, I relied on cloth trainers. We had great success for a while, but I'll admit, I still wouldn't consider him fully potty trained. 1. Preschool - Once school started (two mornings a week) he wouldn't tell his teachers he needed to go. Add in the fact that he was stressed and having major separation anxiety at drop off. I was sending him in cloth trainers, but the teachers just couldn't keep up. Trainers aren't meant to absorb as much as a diaper and in his anger at drop-off his clothes would be soaked. We discussed sending him in diapers, but I really didn't want to back track. After trying the cloth trainers for a couple of weeks, I caved and went with Pull-ups. He didn't leak out of those when at school and they were better than diapers because they pull up and down for the times the teachers could get him to go potty. I think the pull-ups are a set back, but it's a chance I took. I was more interested in helping him adjust to being at school than I was in him potty training. 2. Church - We go to three services a week, one on Wednesday nights and two on Sunday mornings (back to back). Each service is about 90 minutes. I take him to the potty before each service and was sending him in cloth trainers. Once again, he wasn't telling the teachers he needed to go. I ditched the cloth trainers at church after one nursery worker threw away one of our trainers because it was "soiled." I won't go into the specifics, but I was upset and yes, I got my trainer back and took it home and washed it. I decided at such a large church with a lot of kids in each service, perhaps cloth trainers was too much and decided to use Pull-ups there too. As much as I hate it, I felt like it was the best compromise. 3. Busy boy! - This child is busy! After resorting to Pull-ups when he is with others, I feel like that gave him free reign to play uninterrupted. I think he became confused because the potty training wasn't consistent. At home, he would have multiple accidents, whether he was naked, in underwear, or in trainers. My husband and I decided to try the discipline route (even though it's not recommended) and found that wasn't working either. We actually feel really guilty and ditched that method. A few weeks ago, at a local children's store, my husband spotted a display for the Potty Watch. He thought it would be a great idea, but I was skeptical. How could a watch that alerted him it was time to go potty be any more effective than me saying the same thing? I needed help though. Everything we tried wasn't working, so we decided to purchase one and give it a go. BEST IDEA EVER! The Potty Watch doesn't display the actual time. It's basically a timer. The parent chooses how often the alarm will sound in intervals of 30, 60 or 90 minutes. To set the timer, you have to hold down two buttons. There is no way my toddler can figure out how to mess up the timer or reset it. When the timer goes off, a song plays (no words, just music) alerting the child it's time to go potty. When the song finishes, the countdown starts all over again. When your child is sleeping, you just set the watch to "off" and nothing will happen. The watch comes in three colors, blue, green or pink, and is a colored band with the watch face looking like a toilet. While I'm not a huge fan of the toilet part, it's not terribly ugly. The watch is supposed to be worn by the child. I have read reviews were people were concerned about the watch getting wet when the child washes their hands, but this hasn't been an issue for us. My son doesn't like wearing the watch on his wrist. Instead, we just attach it to his belt loops. If he's in pajamas or pants with no belt loops, I just leave the Potty Watch nearby where we can here it. You guys, it actually works! I even ventured out to run errands today with my son in underwear! Every time the watch goes off my son says "OH!" and runs to the potty! We make him try and most of the time he will go. I have the timer set for one hour. I do find that if he tries to pee and can't, then he sometimes won't make it to the next interval without having an accident. We've been turning on the watch first thing in the morning and then turning it off during nap time, then back on again until bed time. No matter what we're doing, we stop to go potty when the song plays. I really feel like this consistency is important. You could be like me and think you can make your child use the bathroom every hour, but I need the reminder too! Many times the watch has gone off and I can't believe an hour has already passed. Time flies when you are a busy mom! I'm sure there are apps you could download for your phone too, but with phone calls and notifications, I think it helps my toddler to have a separate device making noise. The Potty Watch makes it easy to listen for and not tune out. You can purchase the Potty Watch on Amazon. I bought ours at a local store. I really can't recommend it enough! I'm still using trainers for nap time and diapers at night, but I'm hoping to transition into using the watch at school and church as well. He really needs the reminders to use the potty. Because I love this product so much, I'm giving you a chance to win one! 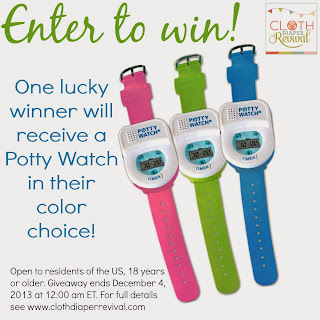 Enter below to win your own Potty Watch in the color of your choice! Be sure to come back soon! I'll have a full review and giveaway of my favorite cloth trainer! In the mean time, you can see my overview of the cloth trainers we've tried here. P.S. This is not a sponsored post! I absolutely love and believe in this product! But this post does contain affiliate links. I don't have any tips or experience. But I do think that a parent should let the child set the pace and try not to pressure their child. I think this is such a great idea - takes the "battle of wills" issue out of what y just needs to be a simple reminder for both moms and kids! Glad to have read this before we plunge into the potty training! My son is going to be potty training in the next couple of months and the Potty Watch would be super handy. I don't have any tips because we haven't started yet, but I do agree with you that consistency is the key. I think something like the potty watch would be great for us since our son is in daycare. With the watch he would have the same cue at home as in the center, which would help him train faster. We haven't started potty training yet. But I hear it is a challenge. We have begun potty training. This would be awesome! I let him lead, didn't push and never punished. I would love this. Our 2 1/2 year old was almost potty trained before baby #2 came along and I got distracted -- but when he was doing well it was because I had MY watch set for every 30 minutes (otherwise I would remember to ask!). 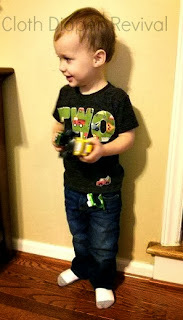 It worked wonderfully for a wile - such that any time he heard my watch beep he would say, "potty timer!" He no longer wants to even try when my watch beeps though, and I think that having his very own watch would make a huge difference in that. Hope I win! WAIT UNTIL YOUR CHILD IS READY... don't push it. Thanks for the post. This information could be very useful as we potty train our son. These are supposed to be great! The dry time clinic suggested one of these for our bedwetter because frequent voiding during the day helps reduce bedwetting. We never did get one as it wasn't in the budget at the time but we did manage to get her to use the bathroom more often without it because she was older (12) and was highly motivated. We haven't reached this stage yet, but I think this is a great idea. Simple, yet effective! Good idea, my 17mo old is showing signs of awareness but doesn't like to sit on potty yet. I have no tips; still waiting for my son to show an interest in the potty. He likes going in the bathroom and flushing the toilet, but as far as sitting on said toilet? Meh. He's got better things to do. Cloth diapers then cloth trainers really make potty training so much easier!! Don't push it too soon. Have naked time. Give positive reinforcement when they go on the potty so they understand that is the expectation and don't make a big deal of accidents as they will happen, at least at first.